Osman Sow’s goalscoring target for the season is 20, although the Hearts striker decided to rethink his initial aim due to his recent injury absence. Sow has not played competitively since October 26 and consequently reduced his pre-season target of 25 goals by five. He currently has eight – seven in the league and one in the Petrofac Training Cup – and resumes the personal challenge tomorrow when he finally returns from a torn thigh muscle. Falkirk are the visitors to Tynecastle for Sow’s reappearance after a lay-off of more than 12 weeks. The giant Swede is eager to get going again and power on towards his stated ambition. The first priority remains Hearts’ promotion back to the Scottish Premiership but thereafter Sow wants to hit the 20-goal mark. It is a tall order, for there are just 16 matches remaining for him to find the 12 strikes required. He is unflustered about the pressure. On top of his own ambitions, he has to satisfy the many Hearts fans who placed bets on him to finish top scorer in the Championship. It’s all in a season’s work for Sow. “I had a personal target before I got injured. Now I need to change it to five goals less,” he said in an exclusive Evening News interview. “Twenty is what I want, which will be hard but you need to set a high target. I would be really happy with that, then I could have a good summer. I want to be available and play as much as possible. I’d like to get some goals but the main thing is to get promoted. If we get promoted and I don’t score any goals, I’m still happy. “If we get promoted and I score ten more goals, I’m more happy. We have a team which is good for strikers to play in because you get a lot of opportunities. He is fully aware people are willing him on because they have money resting on his ability to bulge some nets. Scottish bookmaker McBookie received a flood of bets last summer after offering odds of 20/1 on Sow ending the season as the Championship’s top goalscorer. Those were soon shortened but many fans acted quickly to take advantage of the early price and are desperate for Sow to deliver. “Maybe 15 or 20 people have told me that, but it’s okay. I don’t mind that kind of pressure. I just try to do my best and make them happy. That’s all I can do,” said the 24-year-old. It may take some time for Sow to reach full match fitness again after such a long absence. He stressed he is feeling fresh after recovering from the thigh tear, helped by 45 minutes for Hearts Under-20s against Hibs on Tuesday night. He spent much of last season inactive at Crystal Palace after they failed to register him for the English Premier League and was just beginning to get into his loping stride when injury struck last October. 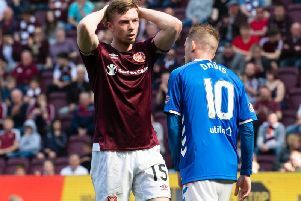 “I had some problems with it before the Hibs game [his last first-team appearance] and then I felt it after the Hibs game. I rested for about ten days but when I tried to train the thigh went completely. I was about to shoot and as soon as I took the shot I just felt the pain. You feel it when it’s for real. I knew I was out for a long time. Robbie Neilson, the Hearts head coach, must decide whether to play Sow from the start alongside recent loan signing Genero Zeefuik tomorrow against Falkirk. Sow is confident he is ready to start the match if asked. “I’m available so it’s up to the manager. If I played some of the game, I will give everything I’ve got until I can’t give any more,” he smiled. Like most footballers, he is not a good spectator. Seeing Hearts remain unbeaten and 13 points clear at the top of the league has made his winter of discontent a little easier to handle. “It’s hard, I can’t really watch,” admitted Sow. “I’m just happy we are winning, although it’s difficult to sit and watch that. I sit in the stand and imagine myself being on that pitch.